For this week's amazing challenge by PritiLisa at Inspiration Avenue, I created a Soul Collage card. Lisa asked for an allegory, so if you are interested in my process of arriving at this card and its allegory, you can read further down. I have named this card, Change, the Eternal Spring. It speaks to me of the eternal river of life that feeds the Soul and the Self. Life has a tendency to turn us into stone, like the Gorgon sister Medusa. Our hair (our ego and thought processes) becomes an entangled mess and we become fearful of change. Change is indeed a death of the known and a re-birth into the unknown. Therefore, like Persephone, we have to either enter the Underworld willingly by ingesting the seeds of the pomegranate, or we will be taken by force by Hades. Once we have surrendered to the darkness of the Underworld and died to the old, can we be born to the new : to a new way of thinking, acting and feeling. Once we have faced our deepest fears in the Underworld, can we be re-born as the Spring Queen with a new wisdom. Once we have surrendered to the cycles of our psyche and soul, can we celebrate the rebirth of compassionate love for ourselves and our own life journey. With true artistic freedom, I combined the Greek and Roman myths, some Jungian philosophy and the great Christian divine epic of struggle, death and resurrection into new life, all into one SoulCollage card that speaks to me of the allegory of my own journey with light and dark. 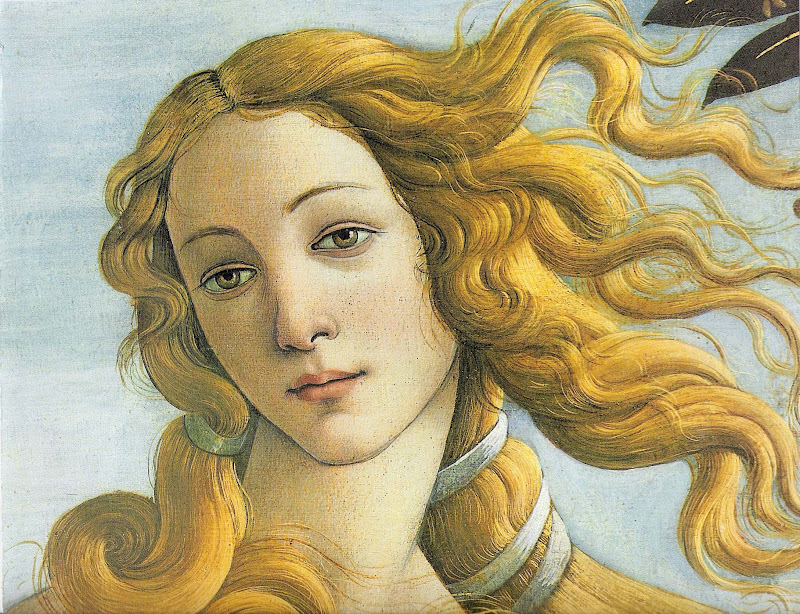 Central to the card is Venus, the Goddess of Love, she who is Soul and Anima and Divine Feminine. She is the one that is hidden in the allegory of life; the one that speak to me through the Nine Muses and through the ordinary sacredness of life. On the left hand side is Persephone, the Greek maiden who was abducted by Hades, the Lord of the Underworld. Whilst down there she ate 6 seeds of the pomegranate which meant that she had to stay there for six months of the year!! When she emerges from the Underworld, she returns as Kore, the Queen of the Underworld. Hades, as the Lord of the Underworld, represent our shadow, that which we do not want to face nor accept. This may be sickness, or loss, or longing, or regret. Underneath her is Medusa, a very famous Gorgon. Her story tells of her long hair which turned into snakes. According to some philosophies, hair represent the ego, the identity that we create and maintain to the outside world and to ourselves. Medusa represents 'taking a long hard look in the mirror of the subconscious self and to face the inner demons or snakes that frighten one into withdrawal and isolation (amongst others). Underneath all of these is the image of the broken body of Jesus the Christ, taken down from the cross, with the women who stood vigil - the Pieta, also by Botticelli. 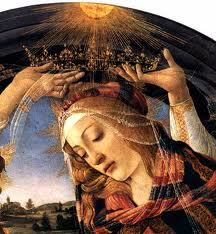 And on the very far right is the crowning of the Blessed Mother as the Queen of Heaven. The new life and Divine Love as a nurturing, giving and compassionate inner giving, understanding that the Spring Within is an eternal Well of sweet life-giving water. Beautiful, both the images and the words. I've heard of Soul Collage and it sounds interesting. I'll have a peek at what you are doing there. Wow Hettienne you've created such an amazing allegory - full of wisdom & beauty this card holds so much to meditate on. A superb and powerful entry for this week's challenge! Beautiful work! I had not heard of soul collages before, and I really enjoyed reading the description of each image. This is a very fascinating art form. What an amazing card, so full of imagery and meaning. Lovely. I am going to find out some more about soul cards now! I really enjoyed this post...just about as perfect as can be! I love all of the symbolism and the way it all makes perfect sense. Like the pieces of a puzzle fitting together. Oh this is a stunning soul card Hettienne. I just thought I had my thinking cap on, but it must have fallen off. Your post and soul collage has given me much to think about. Powerful post and nice submission for Primavera! A lovely card collage. Much to think on. I never heard of Soul Cards. A beautiful soul card, Hettienne! I love all the imagery and the way it starts dark on the left and proceeds to lightness on the right. It speaks of triumphing over darkness, although darkness is a part of life too. I had not heard of soul cards...the concept sounds fascinating. Love the text you wrote also! I'm not normally this late getting here to see your IA challenge, but a tornado and high winds put a damper on my computer time, and then it was hard to catch up. I've learned something new today. I have never heard of soul cards before, so this was a fun experience for me. Thank you for sharing this amazing art and concept.